January often brings thought of reflections over the past year. Possibly changes that took place, or looking ahead, anticipating changes to come in the next year. 2016 brought several changes for my family, few easier to handle than others. As the new year drew closer, I began earnestly seeking scripture for the new year. In my spirit, I new all the change the Lord was doing in our lives was for a reason. But where would all these changes take us? Then I read Isaiah 43: 19. 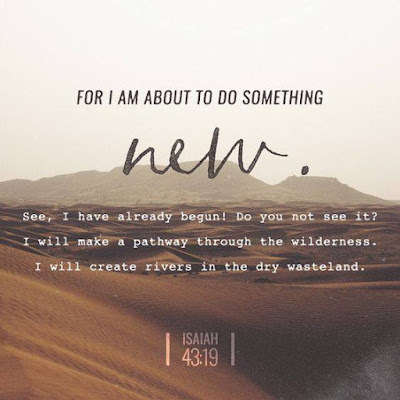 "For I am about to do something new. See, I have already begun! Do you not see it? I will make a pathway through the wilderness. I will create rivers in the dray wasteland." Powerful words with a wonderful reminder. What makes no sense to us, makes perfect sense to our Lord. We can't always see beyond the mess or the stress of today. 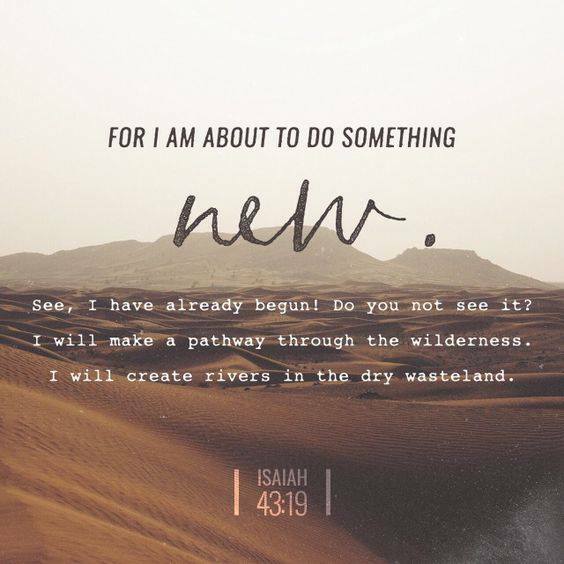 But God has already begun something new! He can make a way where there looks like no way is possible. He can take something broken and make it new. He can even use you in the most unlikely way, turning your weaknesses into strengths.